My name is Echo Kayser. I am a mom of 3 and a pastor to many. God has given me a heart to take small steps in the church and in the home now that will raise the odds of our young people loving Jesus and living their lives in light of that love when they hit adulthood. Loving and Following Jesus since the age of 4…that’s 33 years if anyone wants to do the math! Been married to my best friend, Tim for 17 years. Tim is an amazing man! I just really like him a lot and love that I get to do life with him. We have 3 kids. Our girls are 13 and 11 and our baby boy is 9. We’ve been serving as pastors at Risen King Community Church in Redding, CA since August of 2000. Tim has been on staff that whole time, his ministry covers a lot of areas and has developed and changed over the years. Most recently he is the Senior Leader of Local Church Ministry. I have been on and off staff, depending on where I was at with having babies, always in the area of KIDS ministry. I have been consistently serving as the KIDS ministry pastor for the past 6 years. 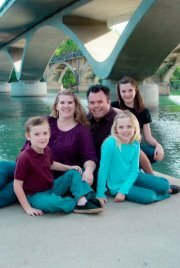 In January 2011, my title changed to Family Ministries Pastor to reflect where the ministry was heading. I lead an amazing team of staff, volunteer leaders and many volunteers to reach kids from infants through high school where they are and to walk them one step closer to Jesus. In the past couple of years, God has been working in my heart and life to be more thoughtful and strategic in working with families to disciple the kids and youth in their lives. This passion for seeing kids be all that God has made them to be is what fuels my desire to share with others serving in the church and with families some of my thoughts, ideas and experiments to practically disciple the kids in our lives toward Jesus. can i reprint this for my newsletter I send to fellowship of Christian athletes via email and website?